Star Wars: The Rise of Skywalker‘s trailer reveal and panel were easily the standout attractions from this year’s Star Wars Celebration in Chicago. However, the event still had plenty of other surprises in store for fans of the franchise. 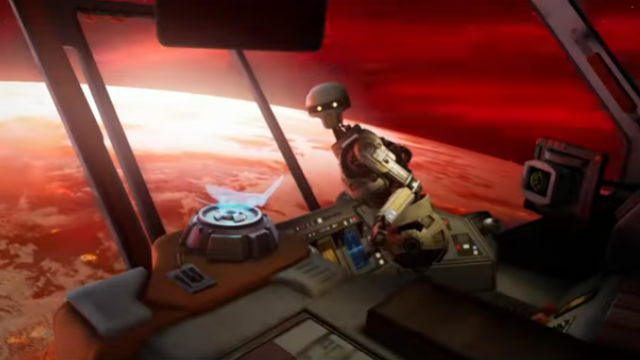 Lucasfilm also shared a new trailer for Vader Immortal: A Star Wars VR Series, which arrives on Oculus Quest and Rift headsets later this year. Vader Immortal’s story is split into three chapters set between Episodes III and IV of the Star Wars saga. Players assume the role of a smuggler who is captured by Darth Vader’s forces and detained in his castle on Mustafar. According to one of the other prisoners, your imprisonment brings Vader one step closer to achieving “enormous power.” With this, you have have no choice but to escape with the help of new allies, including a levitating droid voiced by Maya Rudolph. Vader Immortal was written and executive produced by David S. Goyer. Players will have the chance to wage epic space battles and wield their own lightsaber against a wide variety of enemies. That list of enemies includes Vader himself. But whether your character stands up to the Dark Lord or aligns with him is entirely up to you. So far, 2019 is shaping up to be a big comeback year for Star Wars-themed video games. In addition to Vader Immortal, EA is gearing up for the release of Star Wars Jedi: Fallen Order. That game is due to be released on PlayStation 4, Xbox One, and Microsoft Windows. Episode I of Vader Immortal is still without an official release date. You can check out the game’s latest trailer below. What are your initial impressions of this Star Wars VR experience? Let us know in the comment section!